Jon Kelly Kitna (born September 21, 1972) is an American football coach and former quarterback. After playing college football for Central Washington University, he signed with the Seattle Seahawks in 1996 and was allocated to the Barcelona Dragons of NFL Europe in 1997. He led the Dragons to a World Bowl championship, and became the starting quarterback for the Seahawks in 1998 after spending the 1997 and most of the 1998 seasons as the backup to Warren Moon. Following a four-year stint with Seattle, Kitna signed with the Cincinnati Bengals in 2001. He played for the Bengals from 2001 to 2005 as their starting quarterback, and, later, the mentor to Carson Palmer. He was a member of the Detroit Lions from 2006 to 2008, and the Dallas Cowboys from 2009 to 2011. He also holds the record for most yards in a thanksgiving day game with 742 yards. Kitna was born and raised in Tacoma, Washington, where he attended Concordia Lutheran School and Lincoln High School, lettering in football, basketball and baseball. He moved on to Central Washington University without an athletic scholarship and became a starter at quarterback as a freshman, passing for 1,964 Yards. The next year he posted 3,241 yards. As a junior he registered 2,532 passing yards. In 1995, he tallied 4,616 passing yards on 364-of-576 completions (63.1%), 42 touchdowns and 14 interceptions, while leading the Wildcats to the NAIA Football National Championship. He finished his college career with 43 games, 12,353 passing yards, 911-of-1,550 completions (58.8%), 99 touchdowns and 59 interceptions. In 2006, he was inducted into the Central Washington University Athletic Hall of Fame. In 2014, he was inducted into the Pacific Northwest Football Hall of Fame. Believing that his football career was over after the NAIA championship, Kitna finished his math education degree at Central Washington and began applying for high-school coaching jobs. Seattle Seahawks head coach Dennis Erickson visited the campus to give a tryout for his nephew, a receiver on the Central Washington team. Impressed by Kitna's strong passes, on April 25, the Seahawks signed him as an undrafted free agent to attend the 1996 training camp. He made the practice squad and was sent to NFL Europe at the end of his rookie season. Kitna was named the MVP in NFL Europe's 1997 championship game, when he led the Barcelona Dragons to the World Bowl Championship (World Bowl V), winning 38–24 over the Rhein Fire. He served as a backup to Warren Moon in 1997 and most of 1998, until starting the final five games. Then, in 1999, he started 15 games for the Seahawks, leading them to a 9–7 record (Kitna going 8–7 in games started) and winning the AFC West, though Seattle would lose the wild card game to the Miami Dolphins. In 2000, Kitna opened the season with a four-interception performance against the Dolphins which opened the door for coach Mike Holmgren to start Brock Huard. During that season, Kitna and Huard rotated as starting QBs due to injury and benchings. On November 5, down 15-14 on 3rd-and-16 with 1:28 left in the game, Kitna dodged a possible 17-yard sack by San Diego Chargers defensive end Neil Smith and made an 18-yard pass to Darrell Jackson. This pass set up the game-winning field goal by Rian Lindell. His last win for the Seahawks came on a rain-soaked Husky Stadium turf in December of that year, beating the AFC Championship Game-bound Oakland Raiders on a TD pass to rookie Darrell Jackson in the final minute of play. In 2003, Kitna played every offensive down, and was named the NFL Comeback Player of the Year after throwing for over 3,500 yards and 26 touchdown passes in leading the Bengals to a respectable 8–8 record, the team's first non-losing season since 1996. Kitna's secondary role with the team was to prepare young quarterback Carson Palmer (the Bengals' #1 draft pick in 2003). It was a role Kitna accepted gracefully. By 2004, Palmer was ready, leading the Bengals to another 8–8 season. Kitna was the backup for Palmer in that season. The two QB's developed a close friendship off the field, particularly because both men are avid golfers. He was unexpectedly thrust back behind center during the Bengals' AFC Wild Card Playoff game against the Pittsburgh Steelers on January 8, 2006. Palmer went down with a knee injury on his second play from scrimmage and Kitna stepped in off the bench and into a relief role. Kitna finished 24-40 for 197 yards with one touchdown and two interceptions and a fumble as the Bengals fell to the eventual Super Bowl XL champion Pittsburgh Steelers 31–17. 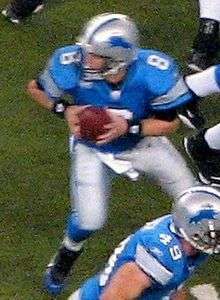 Kitna in 2007 with the Detroit Lions. Kitna signed with the Detroit Lions as an unrestricted free agent on March 14, 2006. In 2006, he registered 4,208 passing yards, 21 touchdowns and 22 interceptions. He also became the second quarterback in franchise history (after Scott Mitchell) to pass for 4,000 yards in one season. In 2007, the offense was ranked ninth in the league in passing, with Kitna throwing for 4,068 yards, 18 touchdowns and 20 interceptions. In 2008, he suffered a back injury in the fourth game of the season and was placed on the injured reserve list on October 14. The team ended the regular season with an 0–16 record and Kitna passed Charlie Batch for the eighth place on Detroit’s all-time passing list with 9,034 yards. Kitna was traded to the Dallas Cowboys on February 28, 2009, in exchange for cornerback Anthony Henry. In 2009, the Dallas Cowboys acquired him to be Tony Romo's primary back-up, with rookie Stephen McGee as the third-string quarterback. He did not play a single down for the Cowboys in the 2009 season. Kitna remained idle until October 25, 2010, when Romo was placed on the injured reserve list, after suffering a broken clavicle. Kitna ended up injuring himself on December 25, 2010, in a game against the Arizona Cardinals. Kitna played well in relief of Romo throwing for 2,365 yards, 16 touchdowns and 12 interceptions in the 9 games he started, compiling a 4-5 record and a career high 88.9 passer rating in the process. He was replaced by third-stringer McGee in the season finale against the Eagles. The next year he was limited to only 3 games because of a back injury and was placed on the injured reserve list On December 14. The injury forced him to announce his retirement from the NFL on January 12, 2012. On December 24, 2013, Kitna was called out of retirement to serve as back-up quarterback to Kyle Orton for the Cowboys, following a back injury to Romo. He donated his salary ($55,294 before taxes) from his 2013 signing with Dallas for the final game to the Lincoln High School Booster Club. From 2012 to 2014, Kitna was a math teacher and head football coach at alma mater, Lincoln High School. As coach he led the team to a 5–5 record in the 2012 season. Lincoln improved to 8–2 in 2013 and 11–1 in 2014. Lincoln shared the Washington Interscholastic Activities Association District 3A Narrows regular season championship in 2013, with a 5–1 conference record tied with Lacey Timberline. In 2014, Lincoln went 7–0 in conference play and won the outright regular season championship. In January 2015, he resigned from Lincoln and accepted the head coaching job at Waxahachie High School in Waxahachie, Texas, south of Dallas. Kitna became a Christian while attending Central Washington University. His parents, who had previously been non-religious, later became Christians as well. Kitna has 4 children with his wife Jeni. His son Jordan was the starting quarterback at Lincoln High for the 2014 season and threw for 55 touchdowns in an 11–1 season. In 2016, Jordan joined the TCU Horned Frogs football team as a preferred walk-on and is the team's back-up quarterback as a freshman. 5 5 0 .500 4th in WA 3A Narrows 0 1 .000 Lost to Bellevue (WA) in 3A First Round. 8 2 0 .800 T-1st in WA 3A Narrows 0 1 .000 Lost to Sammamish (WA) Eastside Catholic in 3A First Round. 11 1 0 .917 1st in WA 3A Narrows 2 1 .667 Lost to Sammamish (WA) Eastside Catholic in 3A Quarterfinals. 1 2 3 4 Carpenter, Les (2012-12-19). "Former NFL QB Jon Kitna finds 'gold mine' at his troubled old high school". Yahoo! Sports. Retrieved December 20, 2012. 1 2 O'Neil, Danny (May 19, 2012). "Jon Kitna's greatest play: NFL QB to high-school math teacher". The Seattle Times. ↑ "A Star is Born". NFL.com. NFL Enterprises, LLC. Retrieved 27 December 2013. ↑ Trotter, Jim. "Chargers beat Seahawks everywhere except where it matters, the scoreboard". San Diego Union-Tribune. Archived from the original on December 7, 2000. ↑ Purdy, Mark (December 17, 2000). "New Raiders revert to old Raiders form". San Jose Mercury News. ↑ "AROUND THE NFL; Bengals, Kitna Agree to Terms". March 9, 2001. ↑ Bell, Jarrett (January 9, 2006). "Steel hurtin': Steelers roll". USA Today. ↑ "Giants rough up Romo, Cowboys to seize control of NFC East". Associated Press. 2010-10-26. ↑ "Former Cincinnati Bengal Jon Kitna Decides to Retire". ↑ "Cowboys decide on... Jon Kitna to backup Kyle Orton". ↑ Archer, Todd. "Cowboys' Jon Kitna will give his game check to high school team". ESPN.com. ESPN Internet Ventures. Retrieved 27 December 2013. ↑ Cotterill, TJ. "Jon Kitna resigns coaching, teaching job at Lincoln High to take job in Texas". Tacoma News-Tribune. Retrieved January 22, 2015. ↑ The Increase Stories (April 3, 2013). Jon Kitna - My Story. YouTube. Retrieved June 12, 2015. ↑ Cox, Allen. "Casual Comfort - South Sound Magazine". South Sound Magazine. Premier Media Group. Retrieved 25 December 2013. ↑ "TCU Horned Frogs football roster". Retrieved September 10, 2016. Wikimedia Commons has media related to Jon Kitna.